We are committed to providing the people using our services with the best possible care, and we recognise and reward staff who provide outstanding care, in our annual staff awards. Nominees receive their awards at a special ceremony: winners are presented with a certificate, a trophy and gift vouchers in recognition of their hard work. The annual Improving Patient Experience Award is given out to staff members specifically nominated by members of the public. It is part of our commitment to providing you with the best possible care, and each year, we ask the people we care for to let us know when a member of staff or a team has made a real difference to you. 2016 winner Charlotte Collins (centre) with Chairman Martin Howell (left) and Chief Executive Stuart Bell. 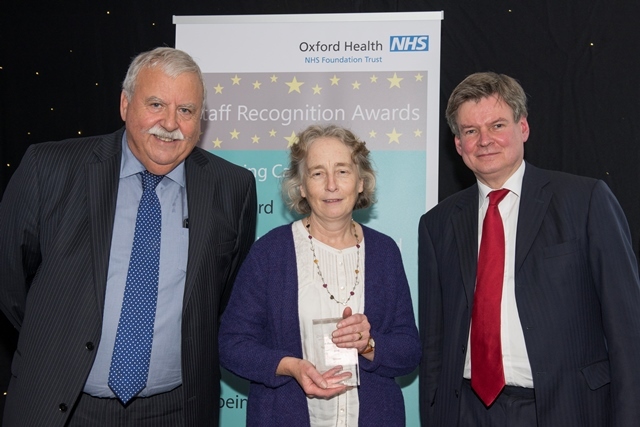 Find out more about last year’s Improving Patient Experience award. If you feel that a member of our staff has made a real difference to you or has gone the extra mile, let us know! Nominations for the 2018 award close 28th September 2018. You can also email us to get a hard copy of the nominations form if you prefer. Find out more about the 2016 award winners.